As the holiday countdown accelerates, Christmas trees are on the run. Or more precisely, on the roll—in shopping carts and wheelbarrows—and on the lug, by hand. Streaks of deep green dot the dull gray landscape as the trees move by. I’ve seen them slung over shoulders like children, tucked under arms like medieval spears, and propped up like commuters on the subway. The doors open and the tree steps off, a memory of pine needles on the train floor. Sometimes the whole family chips in. Parents hug the end like goal posts while a couple of little kids lift the saggy middle. The whole street smiles at the effort. A grand behemoth is a joyful burden. Ten blocks home or five flights up can loom like eternity. 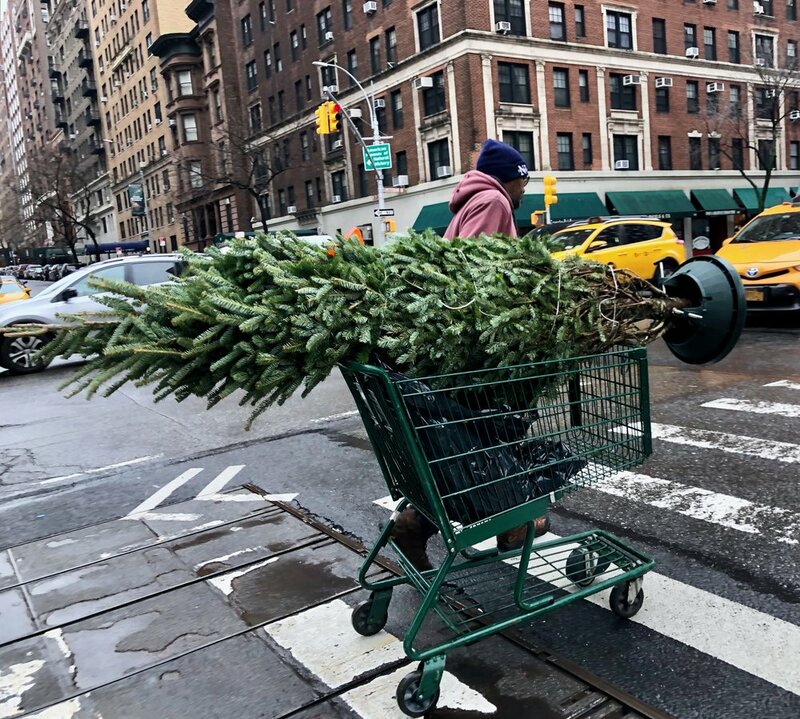 But it’s an essential New York tradition—the tree must go on.